UPSC conducts CDS examination 2 times in a year offering a golden opportunity to thousands of aspirants interested to serve in Indian Defense.The Union Public Service Commission will be conducting the Combined Defence Services Examination (II), 2018 at different venues located at 41 Centres throughout the country on 18.11.2018 (Sunday) for Indian Military Academy, Officers Training Academy, Indian Naval Academy & Indian Air Force Academy. Within this gap of time, we hope all the devoted aspirants would have burnt the midnight oil paving the way for holding a secured seat in a pristine organization. 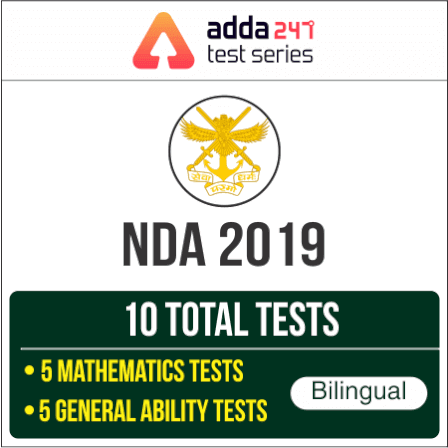 Adda247 and team greets best wishes to all the aspirants who are going to appear for CDS Pre Exam tomorrow. This exam is all about to check an applicant’s legerity, mental strength, physical fitness, communication skills and dexterous personality demanding apt knowledge of mandatory sections i.e Elementary Maths, English and General Awareness. So dear aspirants, know the value of this platinum chance, appear in the exam hall carrying a confident aura, optimistic insight and keenly planned strategy involving proper time allotment to each question based on their priority and avoidance of mistakes and waste of time in calculative questions. Develop a calm composure before the day of exam. Take adequate sleep to escape absurdness, you can revise the topics and tricks you learned this far. Stop overthinking viz-a-viz consequences and anything that stymies your focus towards your exam. If you have made a mindset to look for this exam, it undoubtedly means how much important this exam is for you. Go with a winner mindset and come out being a winner. Also it is essential to attempt maximum number of questions with appreciating accuracy so as to not to just borderline the cutoff but reaching ahead of it. The candidates may note that no paper admit card will be issued. In case the photograph is not printed or available. Candidates are advised to carry three (03) photographs (one identical photograph for each session) along with proof of identity such as identity Card etc , print out of e-Admit Card at the venue of the Examination to secure admission in the Examination.